To enable DualStream64 you have to install identical DDR DIMMs in pairs, in the correct slots. The colour coded DIMMs make this pretty foolproof. 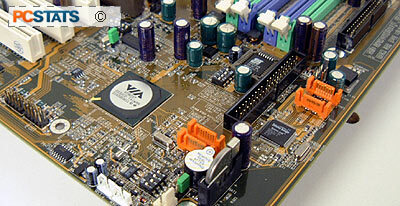 The PT880 reference board is not just to show off the new Northbridge, but also demonstrate several other VIA chipsets that are hitting the market now. 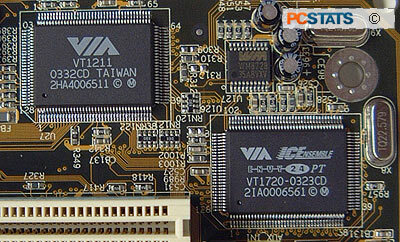 Those technologies include VIAs Envy24 PT soundcard, and the new VT6120 Cicada SimpliPHY Gigabit Network controller! When it comes to onboard sound, PCstats has been critical of manufacturers for including low quality AC'97 software based codecs. Even I can hear the difference between the CPU sapping software codec and a hardware PCI based soundcard... Be it listening to your MP3 collection or playing games, these inexpensive audio codecs cost us good sound quality, and CPU-cycles. VIA have released the new Envy24PT hardware soundcard to resolve these issues, and hopefully grab a little of the market share from C-media. the Envy24PT chipset is a 7.1-channel solution, which makes VIA one of the first, if not that, to introduce a board level audio solution. With Creative recently releasing their Audigy 2 ZS, hopefully more 7.1 speakers will be coming to market at lower prices too. The VIA Envy24PT supports 24bit audio resolution with 96kHz sampling. This is right up there with the Creative Audigy 2 ZS in terms of audio quality. On top of that, the audio controller also has support for Dolby Digital EX and DTS ES - so the Envy24PT chip should definitely be up to your home theatre/DVD needs. Where many audio codecs (for example Realtek) use the host processor to process the audio, the Envy24PT is a true hardware based solution. Thus, it drains very little CPU resources from the processor which should mean better overall performance, seeing that the system is taxed less. To test the sound, I quickly dropped in instrumental audio CD and listened for distortion with the volume turned up. Even with the volume very high, the high pitched sounds were still very sharp as the lows were also very clear. For my ears anyway, the audio sounded every bit as good as an Audigy 2 soundcard - though this is very subjective.